Author(s): Gebhard Froeba, Oliver Adolph. Department of Anaesthesiology, University of Ulm, Albert-Einstein-Allee 23, 89081 Ulm, Germany. Background: Xenon (Xe) in many respects is an ideal anaesthetic agent. Its blood/gas partition coefficient is lower than that of any other anaesthetic, enabling rapid induction of and emergence from anaesthesia. While the whole body kinetics during wash-in of inhalational anaesthesia is well known, data describing the pharmacokinetics of xenon in the cerebral compartment at the site of action are still largely missing. Methods: In order to illuminate xenon’s cerebral pharmacokinetics, we anaesthetised five pigs and measured arterial, mixed- and sagittal sinus-venous blood, as well as end-expiratory gas concentrations of xenon by gas chromatography-mass spectrometry (GCMS) up to 30 minutes after starting the anaesthetic gas mixture. Results: Despite xenon’s fast onset of effect the half-time for equilibration between xenon concentration in arterial blood and at the site of action is measured to be 1.49 ± 0.04 minutes versus 3.91 ± 0.1 minutes. 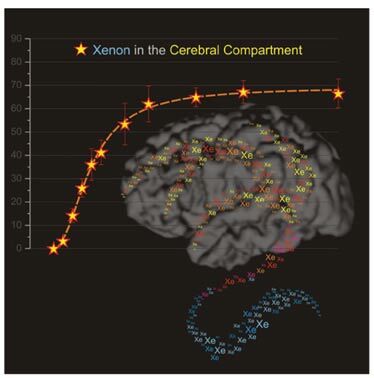 Successful loading of xenon in the brain during inhalational anesthesia was accomplished after approximately 15 minutes although the end-expiratory xenon concentration reached a plateau after 7 minutes. Thus cerebral xenon uptake rate is only moderate, xenon's fast onset of action being largely due to its extremely fast alveolar uptake. Conclusions: To ensure safety and precise control during anaesthesia we need a profound knowledge about to what extent the measured end-tidal concentrations reflect the drug concentrations in the target tissue. The results of this study expand our knowledge about the temporal characteristics of xenon´s pharmacokinetics at its site of action and provide the basis for appropriate clinical protocols and experimental designs of future studies. Keywords: Xenon, pharmacokinetics, cerebral compartment, inhalational anaesthesia, half-time of equilibration, pigs. Affiliation:Department of Anaesthesiology, University of Ulm, Albert-Einstein-Allee 23, 89081 Ulm, Germany. Keywords:Xenon, pharmacokinetics, cerebral compartment, inhalational anaesthesia, half-time of equilibration, pigs. Abstract:Background: Xenon (Xe) in many respects is an ideal anaesthetic agent. Its blood/gas partition coefficient is lower than that of any other anaesthetic, enabling rapid induction of and emergence from anaesthesia. While the whole body kinetics during wash-in of inhalational anaesthesia is well known, data describing the pharmacokinetics of xenon in the cerebral compartment at the site of action are still largely missing.